After catching a cab in the cold night air of Queens at 4 AM last Sunday morning I was at LaGuardia Airport in no time. My flight left at the time advertised and I was in the air on my way to Houston and my connecting flight to San Pedro Sula, Honduras, before most people in New York City were even thinking about awakening. We actually arrived in Houston twenty minutes early which gave me plenty of time to meander from Terminal C to Terminal E and board the plane packed with Baptist missionaries, Hondurans returning home, and birders, including the illustrious Julie Zickefoose. Upon landing, clearing customs was quick, mostly because I hustled to get to near the head of the line, which ended up stretching back quite a ways. My hustle ended up being moot as my checked duffle was one of the last to be put on the baggage carousel and once we birders walked through the crowds of folks awaiting loved ones and found the gentleman holding the Mesoamerican Birding Festival sign we still had to wait for our transportation to Hotel Finca Las Glorias on the shore of Lago de Yojoa. The wait ended up being a bit longer than anticipated so several of us birders did what birders do when we have time to kill: we went birding! The soldiers with automatic weapons guarding the airport didn’t mind we gringos wandering the airport perimeter exclaiming over the birds. I was lucky Julie and some other birders were there to help me figure out the four lifers I got on the grounds of the airport (though I think I would have figured them out eventually on my own). But what lifers were there? One of the first was a Tropical Mockingbird, which looks just like North America’s Northern Mockingbird minus the white on the wings. Another marvelous lifer with a sweet song was the White-collared Seedeater, pictured below with a bird more familiar to North Americans, a Yellow Warbler wintering in the Neotropics. The kettles of Black Vultures overhead contained an occasional Turkey Vulture but neither hawks nor Lesser Yellow-headed Vultures, which was a bit of a bummer, but simply watching the enormous kettles was a joy in and of itself, as were the swarms of Northern Rough-winged, Tree, and Barn Swallows and Purple Martins. A myiarchus flycatcher refused to give up its identity (though I suspect Brown-crested Flycatcher) but a Tropical Kingbird was more than willing to be identified and even allowed a picture (though I would get much better shots later in the trip once I unlimbered my digiscoping rig). The only lifer of the four at the airport that did not allow a recognizable picture was a Blue-gray Tanager, but simply seeing its gorgeous colors was enough for me. Eventually though, the strong sunlight became too much for the pale skin of someone who left below-freezing temperatures behind just that morning, and I retired to the airport bar where cold cervezas were waiting at very cheap prices. Once our bus arrived (about three very good local beers later) we were on the road and every bird I saw made me wish I was driving so I could screech to a halt and get a better look. The only species that were positively identified on the ride that we hadn’t already seen at the airport were White-winged Doves, Cattle Egrets, and the ubiquitous invasives, House Sparrows and Rock Pigeons, though the lack of starlings was nicer than I would have imagined. 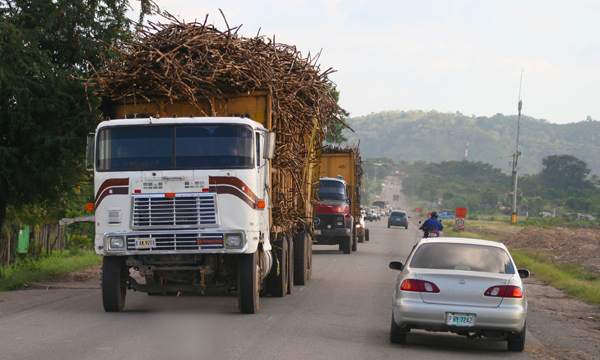 This first-time visitor to the Neotropics was amazed at the way driving is done in Honduras, with rules of the road virtually nonexistent and everything from pedestrians to overloaded trucks all on the road at once. Our arrival at Hotel Finca Las Glorias coincided with sundown so no birding was done before dinner, but our delicious repast made up for the lack of light to some degree, and I retired early to ensure alertness for my first full day of birding Honduras, which would kick off early Monday morning at the archeological site known as Los Naranjos. Come back soon to read all about it! Looking forward to it Corey. I’m excited for you that you got to go. Glad you’re having fun! … more posts, more pix, keep ’em coming. Looks awesome Corey, can’t wait to hear more about it. SWEET! Keep it coming – we’re all anxious for more! looks funnn u lucky uncle! !